No doubt Apple's Siri has become one of the buzzwords since the launch of the iPhone 4S - and I truly believe it represents a landmark on the way to a voice operated future. But, while its secret relies on the immense processing prowess of Apple's cloud servers... yesterday we found out just how fragile this technology actually is, as Siri went silent for millions of americans - simply reporting it couldn't connect to the network. Just like any other cloud based service, things are great... as long as everything works as it should. As soon as something goes wrong, even if elsewhere around the world, you're left if a "dumb assistant". And lets not forget there are still millions of users that are unable/unwilling to have 3G internet connections - rendering Siri useless as well... But that's another issue. 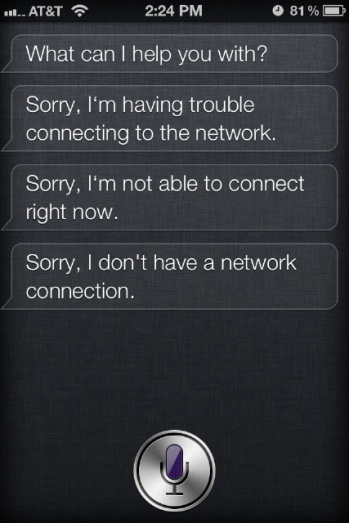 At least in Portugal, I didn't notice any outage on Siri's service, as it kept working fine... So, my guess it that it really was just a localized (albeit large) incident.